Last year I chose three words to help me guide 2012. It’s an idea of Chris Brogan’s that has really taken off and many people have followed in his footsteps. Last year my words were Focus, Organize and Produce. I think I was fairly successful at all three, the biggest focus of all being that I formally joined forces with Karen to create Wellman Wilson Consulting. 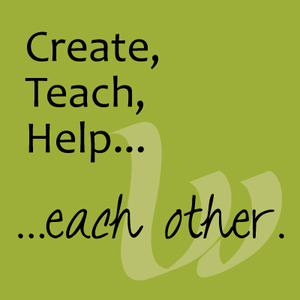 Together we built a business with a clear focus and created/produced new courses and programs. We also started plans for many other programs that will launch this Winter. It was a very good year. As we jump into 2013 I am ready to focus even further and the three words I’ve chosen demonstrate that. It’s not that different from produce except that it takes imagination into account. We don’t all learn in the same ways and we aren’t just producing material for you. A lot of what we have planned for this year is different than anything else we’ve produced in the past. It will involve video and audio and worksheets and e-books. We’re creating new products that we know will help people move forward with social media for their businesses. It’s something we strongly believe in. We want to help you learn the why and the how of social media. You may not choose to do all of the work yourself in the end, but you’ll understand how social media works, and what to do to move forward. We want to empower you in a safe and straightforward environment. We want to make sure you understand and never feel like you can’t ask a question. We want to teach you to fish! Beyond teaching you, we want to be a resource and a support system for you. We are growing our coaching program which is quickly becoming an amazing group of people that all support each other. Tell us how we can help - it’s what we love to do. 2013 is going to be a great year - I have such great and positive feelings about it. How will you focus your energy this year? Can you choose 3 words? Leave a comment and tell us what they are!